Laughter is the best medicine, add that to playing bingo and it’s exactly what the doctor ordered. If you are looking for a giggle or two then Bingo LOL is the right spot to be. It’s filled with smiles and happiness every time you yell bingo. You might have to turn up the air conditioning when entering Bingo LOL because the hot pink background on the homepage is bright. This site will perk you up really fast with an intense heat that the colors emulate. Some players may be inclined to put on their shades when visiting. The jester is your host and has more than few jovial good times ahead for everyone. 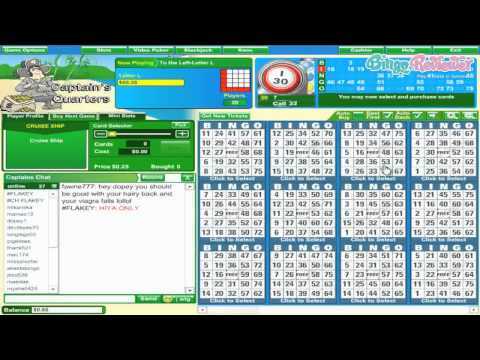 Bingo LOL is a Parlay software site and that means quality bingo gaming is eminent. It’s a guarantee of quality graphics and features that are rated high in the online bingo community. Bingo LOL belongs to the Worldwide Limited network and is one of 14 brands. Players from the USA are accepted. Games are available by downloading software or using Flash version for instant access. 75 ball bingo has four fun bingo rooms to choose from. For players on a budget the Penny Lane room is the perfect choice with cards costing a mere one penny each. Dimes, fifty cent and quarter rooms are offered for those with a larger bankroll. Enter the Around the World Bingo room to play 90 ball bingo. Quick Buy feature offers a various set amount of cards to choose from or players can also select manually the number cards they wish to purchase. Chat is integrated in the software and allows players to communicate with other bingo players in the room. The Mute button will remove any text from a particular player of your choosing. Chat Masters are in each room and are there for any questions you may have. If you are in the mood to stray from the bingo room there is many other gaming options available. Slots feature bonus rounds and free spins with coin values from .05 to .25. Other games include: Video Poker, Keno, Pull Tabs and Casino Games. Players will love the sign-up offer so much they’ll gladly register with a very attractive free chip bonus. Validation of your email is required before the free bonus is placed in your account. An initial sign up Deposit Bonus is available and Reload Bonuses are available every day of the week. Refer your bingo buddies and besides playing bingo with them a sweet reward is gifted to you upon their first deposit. Not only is your friends for life so is a percentage of their deposits too! Chat Bingo Bucks are awarded to players while playing bingo. Hosted by the chat moderator, chat games are interactively played among the bingo roomies. Bingo Bucks are not cashable and can only be used to put into play. Any winnings from BBs can be withdrawn after meeting the play-through requirements. The Promotions page is broken down into several categories of which some are unrelated to promotions. The Current Promos and Monthly Promos are anything but current and a complete disappointment with outdated offers that are several months old. Bingo rooms are generally not crowded which means smaller cash prizes. The promotions are not updated and can be months behind schedule. Our rating for Bingo LOL is 2.5 Pink Hearts. I guess that things have changed for Bingo LOL since the site is now called Bingo Card, but the fact they are online 10 years now and celebrating an anniversary speaks for itself. The site looks decent, but nothing more than that, and I think they should tune down that neon green from the background. Also, I had to look a bit longer for some terms and bonuses regulations, so not so intuitive after all. At the moment, they are having a $30 BB promotion, as well as a 600% initial deposit bonus. After that, they have reload bonuses from 300% to 800%, depending on the amount. You should spend some time reading on the Promotions page, and they have quite a number of active ones, different every single day. If you are a Bingo fan, you may not be thrilled with the fact they have only 75 ball Bingo, and I think that is not enough for me.